'Bloody hell up' - are words I found Australian's like to use as part of their vocabulary to just about describe or address anything. Even if you look on the back of a beer bottle you will find yourself blinking twice in bewilderment to read 'Bloody cold' under the 'serving suggestion'. I was feeling exactly that as I rolled over fidgeting uncomfortably cocooned in my rolled out canvas mattress sleeping bag; my 'swag' as the Aussie's would call it, but frankly sounds more like something you'd say to someone to insult them. I found my left arm and released it out to sluggishly check my watch for what hour it could possible be. 2am. The dead of night. The now serene silence allowed you to anticipate hearing a pin drop. No wonder Marcus was furious, he always had a big day ahead of him and for a very laid back Aussie, he didn't like his sleep disrupted. I heard him come back muttering in annoyance and settle back down to continue his rest as the world grew silent again. I turned to glance over to Baz who was lying frozen, peacefully undisturbed in his swag, his faced turned away in a deep sleep. I turned back and sighed, staring ahead, my heavy misty eyes examining the shape of the light bulbs at the apex; the red and white stripes and the metal frame work like a skeleton, distinguished in the darkness of the biggest tent I've ever slept in - the circus big top. I rolled over on the stage - my bed where I was 'roughing it' during my stint on the Australian carnival circuit and laid motionless blinking my bleary eyes, surveying the spectator stands which by day burst with extravagant colour and energy and by night stood lonely and empty wallowing in rejection. 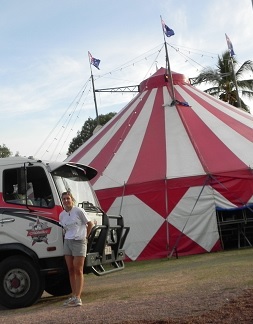 It gave the big top such a ghostly atmosphere, making me shudder in my swag. I hate paranormal stuff, really gives me the creeps. But I began to convince myself of its warmth and homely feel and the fact I was seriously spoilt for space as a 'pommie backpacker' (a term Aussie's like to affectionately call us English) raised amidst the crowded city of London on England's small lone island solitary drifting in the centre of the earth. I should appreciate this eerie silence that would come to an untimely end as yet another dawning of a brand new day rose on the carnival scene. I imagined the roar of the crowd, the laughter, the adrenaline of suspense from their gasps and giggles and the overwhelming sweet smell of popcorn and candyfloss. The scent of cheerful fun and novelty lingered and would yet again soon come alive in several hours time as it did everyday. I had become encapsulated in the showman world of Australia, by accident really and thinking of everyday as a new episode, a new adventure of surprises. I drifted back into a dreamy haze whilst the repetitive tune of circus music that blared from the speakers every night danced along in my head. Never going away. My eyes snapped open. The breaking rays of dawn illuminated the inside of the big top and the deep blood red stripes streaking the inside of the tent were so potent, animatingly pulsating out at me mimicking a comedic cartoon motion picture. I looked over to the other side of the stage and noticed the treasure chest was still there, the top still closed. Well, I was sharing sleeping space with six of the world's deadliest snakes in there so I had to make sure they were alright! Satisfied, I slumped back down on my swag pulling the cover across my nose, revealing just my eyes and breathed in the rugged scent of canvas, then closing them again in a wistful bliss. Suddenly, I heard an almighty feral howl coming from outside the big top and sat bolt upright. 'Skip!' I exclaimed to myself, struggling to wriggle out of my swag and find my 'thongs' which as a English girl found quite funny thinking a pair of flip flops was addressed in Australia as the same name as what we call a girls skimpy underwear in Europe. Finally finding them and slipping them on my feet, I ducked behind the black stage curtain feeling irritably around the canvas for the opening of the big top which was proving quite tricky as the howling outside continued. Frantically after a few tries, I finally fingered the opening and whipped out the flap, sprinting across the dewy morning grass towards the animal trailer in my pyjamas. Skip was poking his wiry snout out through the gaps of the white iron trailer belonging to McCaffey's Animal Farm where he was kept at night to sleep so as not to cause any chaos on the showground or with the other animals. His shrill wild-feral howling suppressed to a pitiful whimper, dramatically quivering his bottom jaw revealing his canines, insisting a puppy love look to me as I approached, his pointed ears attentively listening to my whistles. His eyes lit up and his quivering jaw then stretched into a friendly smile, his tongue hanging out happily panting as I bid him good morning and unhooked his red lead that was hanging on the trailer door. Pulling back the door bolts, I caught him by the collar as he excitedly tried to jump out, wagging his shaggy tail enthusiastically as I hugged him and ruffled his long grey hair on his head hooking the lead on to him. I adore dogs but never had the long-term responsibility of having one of my own. Everyone in Australia I'd met had a dog, right down to the lonely farmer who has their beloved four legged canine friend chained on the back of their utility vehicle (or 'ute' as the Aussie's like to call them) so they could accompany them everywhere. If you were an Aussie, you had a dog. I enjoyed pretending I sort of had one as an English backpacker in Australia - and funny enough, don't you think the shape of Australia on a map does actually look like a dog's head? Look closer, you'll see it. Skip was a special one though, he was an Australian Cattle Dog, very much a unique species exclusive to Australasia. He was a pretty wild hairy fellow with his long grey hair dotted with tan and black spots with a mischievous, charming look in his brown smoldering eyes as if he was going to wink at me. Such a ruggedly handsome raffish dog. Although supposing to possess the genes of an obedient working dog, nature made a blip with Skip as he could be extremely troublesome sometimes and people found him a nightmare to control. But I felt like I had an emotional bond with him and treated Skip as if he was my own dog who needed some nurturing. I think its the same with the relationships people seem to have with horses - that's another thing I noticed in Australia; most Aussie girls have horses or ride horses, you know as if it's just as normal as owning a bicycle. It needn't matter as I stood for a moment in the tranquility of the showground holding Skip's lead whilst he sniffed the ground inquisitively around my feet. I welcomed the breaking sun rays of dawn warming my face as I took a deep breath, curling my nostrils as I felt revitalised by the fresh scent, promising another Queensland winters morning. Just as I looked down to examine my feet which were soaking wet and covered in grass pieces, I felt a strong tug and forcibly ambled forward as Skip jerked on his lead, pulling me to sniff out an available spot to relieve himself. Every morning I would take Skip, or rather Skip would take me for a speedy jaunt around the 'dead' showground before breakfast. It was as if an apocalypse had happened, a peculiar sense of dull emptiness echoed around the abandoned sideshow stalls and fairground rides which would resurrect with a buzz of dynamic electricity once the gates were opened to the public. I actually felt grateful to see this stark contrast of an almost redundant black and white amusement scene stripped raw of energy and colour. Skip and I walked amidst the left over rubbish - the ground dusted with food boxes, discarded cigarette buts, papers and newspaper pages floating dreamingly around in the morning breeze, a reminder to the showground of the presence of yesterdays crowd. Skip contributed in helping to clean it up by sniffing out a box of discarded dumped chips, watching him gobble them up as well as lick the tomato sauce out of the box too. Count on him to find food, but I couldn't help but spread a smile across my face and then suddenly having to yank back on his lead to prevent him from running off and taking me with him, however comical that would have looked. It was always during our morning walks that Skip and I got to witness the daily routine of the showground starting to leisurely come alive as amusement owners and carnival workers emerged from their trailers, lethargically rubbing their eyes and blinking, feeling awakened and blinded by daylight as if they had been in hiding. The clinkering and clunking of bolts being undone, canopies being re erected, car engines roaring and chugging with the commands of working showman shattered the wispy silence in the air. Before the days of modern advertising in TV and Radio, the 1920's, 30's and 40's valued the horse drawn bandwagons that were the fundamental part of setting the scene for Australian carnivals, leading the parade of circus performers, animals and other attractions through the main street of the town where they would finish at the circus lot, ready for show time. As I stared out scanning the scene around me, evidence of the retro traditions of the past were now long gone and had now been replaced with luxury caravans complete with fully equipped bathrooms, freezers and even washing machines. Oh, how times had changed. I could just imagine it, the vibrant colours and hues of the flags and ribbons, the thrill of the performers, drums rhythmically thumping, horns blowing and the cheers of the welcoming crowd echoing through the host town as they'd been anticipating their arrival. What a thrill. My thoughts were interrupted when Skip unexpectedly jerked me forward again, sniffing out a half eaten hamburger. I resisted and jerked him away, then fell victim to his force as he domineeringly started pulling me back towards the huge red and white striped balloon-ed tent which was the circus big top. It sure was a test of strength walking that dog. Tying Skip's lead back on to the white trailer, I pulled out his silver food bowl from a small compartment in the side with a bag of dog biscuits. Skip whimpered and fidgeted at the sight and sound of the biscuits clanking into his bowl, licking his lips, his eyes transfixed on me. I teased him telling him to sit which he'd always do with me and threw a biscuit at him, snapping at it in mid air, chomping on it. I laid the bowl down in front of him and quickly whisked my hands away as he started to wolf down the contents of it, carelessly spilling the biscuits over the brim; funny how animals will be your best friend when there's food around hey? As the BIG BAD WOLF for the three little pigs. Each day in the grounds Petting Zoo Farm Yard Exhibit, Skip sat on top of a hay bale drum next to the pen housing the three piglets. I had made a sign reading 'Skip The Wolf' and attached it on the wall beside him which totally let him bask in attention as eager punters adoringly pampered him thinking he really was a wolf! I smiled down at him tenderly, giving him an affectionate pat on his head. 'No drama's with the young pup?' came a croaky voice behind me. I turned to see it was McCaffey, an elderly man standing in the doorway of a caravan wearing cream trousers tied with a black belt, a high buttoned blue polo shirt and a classic Akruba light brown cowboy hat covering his white hair, a classic look for the Australian agricultural man. His first name was in fact Cliff, Cliff McCaffey but everyone called him by his last name. Maybe just a mark of respect or something. The animal farm previously belonged to him, hence the name and had passed down the responsibility of it to his son John because now being in his late seventies, time was not treating him kind and he sure wasn't a young pup like Skip anymore. McCaffey was quite a prestigious legend in the local area. In his younger years, he had travelled all over Australia in the hotel trade and then converted to the animal and showman business. For many years he earned a living working as a stockman and *'ringer' riding horses on cattle stations in Queensland and then starting his own horse drawn carriage business for corporate events, parties, weddings, anything to romanticise an occasion with the antiquity of horses and carriages. The fact was though, McCaffey had worked hard all his life in the bubble of the Australian showman business and was now just tagging along the circuit to remain close to it all. I didn't blame him, where else would he be happy now? He was now an integral part of the tapestry. 'You want a fried egg for *brekkie darl?' he continued, holding up an egg to me. 'Sure' I replied, nodding and smiling. * Words belonging to Aussie-nism, unexplained strange ways of describing things in English to the rest of the world. 'I said yeah, sure please!' I responded much louder, smiling and holding my thumbs up. 'I'll just get Skip some water!' I added, remembering that McCaffey was unable to hear very well, a consequence of the time he was head butted by a horse in the forehead, weakening his sense of hearing. Rummaging around the trailer making a right clamour of clinking and cluttering everything, I found another silver bowl and followed McCaffey into his caravan where he stood in the small kitchen; his hands jittering as he cracked the egg into the frying pan, one egg already sizzling, presumably for himself. 'Can I use the water?' I indicated to him, pointing at the bowl. 'Sure darl, just try not to waste any,' he replied nodding. I squeezed behind him to turn the tap on where I shoved the silver bowl under the trickling flow, trying not to waste any drops from a continent riddled with drought and dryness. We are plentiful with water in England as Australians are with the sun - maybe a healthy compromise would make us both happy! Watching the water hiss and tinkle in the bowl, a faded newspaper clipping caught my eye above the stove with a black and white photograph of an old man, McCaffey. 'Is that you McCaffey?' I curiously questioned the old man. 'Awww yeeerrr, the paper wrote a story about me back home, think they found me interesting, *fair dinkum article though' he drawled in his nasal Aussie accent. And 'fair dinkum' it was. Dated in 2003, McCaffey, looking really not that much different in the photo, stared blankly back at me with a crooked smile, his sorrowful eyes hidden under his same Akubra hat, whilst holding an Australian flag. I turned the tap off and started to skim read the tiny lettered sentences of the article printed on the yellow, aging newspaper and discovered he had been in the Navy too, ventured on many voyages throughout Asia and had worked with all sorts of people. I couldn't imagine the amount of stories and adventures that had flashed before this old man's eyes, the wisdom and experience instilled in him. He'd lived quite a life. The smell of pungent burning distracted me and I looked down to the frying pan, noticing the eggs looking a shade of shriveled black. McCaffey nonchalantly shrugged off my warning. 'She'll be right darl, she'll be right', he care freely responded. A reply that I heard all too often as an Aussie's response to shunning anything that could be potentially problematic - and why has it always got to be 'she'? why not 'it' or 'he'? No idea, I'm sure there is a method to the madness. It also sounded like McCaffey didn't even pause between saying each word. After I placed Skip's bowl of fresh water on the ground for him to lap up, McCaffey called to me to ask if I wanted my egg in a 'Sanga'. 'Sanga? what does that mean?' I called back loudly. 'Y'know, in between bread, a sanga' he replied jokingly at my ignorance. 'Sure, please' I politely answered, elevating my tone to match his jubilant attitude and of course so he could hear me. Australians are the reigning population who like to shorten everything in the English language to the point where you think they are talking in secret code to you. I walked towards the caravan door and he handed me a plate with an 'egg sanga', tentatively lifting up the bread piece to reveal a virtually black shrivelled egg piece like rubber, the only colour being the blotch of yellow in the middle which was the egg yolk. I stared down at it for a moment, contemplating whether to take it. 'Cheers McCaffey' in my classic english accent, smiling in gratitude as I took the plate from him. 'Get into it darl, all good for ya,' he instructed with authority. Still dressed in my pyjamas, I unfolded a chair leaning up against the caravan and sat myself down outside. I paused for a moment, breathing in and bracing myself before I took a bite out of my burnt 'sanga' when I heard the creaking of another caravan door swinging open. I looked up and out stumbled a red haired tubby man dressed in denim jeans, blue shirt and a black baseball cap, gingerly rubbing the morning sleet out of his eyes. John. McCaffey's son. 'G'day Sal, howzit goin?' he murmured, trailing off into a huge bellowing yawn. I nodded to him in acknowledgement as he slammed his caravan door, which pointlessly just bounced back open again. Trudging over to the trailer, he grabbed his luxury black fold up chair and unfolded it to sit with me, sighing with contentment as he pulled the chairs handles to decline it. Closing his eyes, John relished in another moments peace for himself amongst the hectic craziness of his world devoted to the animal zoo. 'Jono?, hey John, you want an egg sanga?' called McCaffey to his son from inside his caravan. 'Nah, nah, you're alright mate!' shouted John, his eyes still closed leant back in his chair. His big grubby pale bare feet sticking up. 'On a diet, none of that rubbish,' he added. Weird calling your own dad 'mate'. I can't ever imagine doing that. I decided to leave the rest of my 'sanga' and generously donate it to Skip who would just about eat anything when I heard screeching noises coming from the direction of the animal shed. The ensemble of grunting, mooing, squealing, chirping, squawking, clucking built up as one animal prompted the other, singing in a muddled melody. The wake up call, to top it off, was the high piercing cockle of the cockerel. 'Jesus, those animals are making quite a racket!' complained McCaffey, slouching against the doorway of his caravan, clutching a brown beer bottle. 'Y'wanna a *stubby from the *Esky?' he asked us, holding the bottle up. John, even more laid back than his father, quickly sat up and winced at him. 'Strewth, bit early for *grog mate, you've been flogging the wagon too much recently' he responded, curling his lip disapprovingly. Now the translation of the conversation that I just heard in Australian English to British English was as followed...I was asked if I wanted a bottle of beer from the cool box, then understanding it was too early to be having a drink, then McCaffey being told by John he's been drinking too much recently. How are you?. Queens English. Get it? You get used to breaking the code after a while. Maybe it is backwards, but not to fault any lack of drama or unpredictability in this big sunburnt island tucked away 'Down Under' from the rest of the world. 'How about seein' to those animals Sal?, they'll be escaping the shed if they don't get some brekkie soon,' requested John, raising his eyebrows as he jiggled his black baseball cap up and down on his head. As I was about to get up out of my chair, he reached down and plucked a little yellow flower out of the ground. Holding it delicately between his thumb and his middle finger, he leant over and dropped it on the top of my head. 'Too easy, Princess' giving me a wink and a warm crooked smile. John was as cool an Aussie you could get, cool as the beer McCaffey got from the esky. My kind of boss to work for. He never raised his voice ever and spoke with such calmness and stillness. He also trusted me, which is always a major compliment especially being an 'outsider' to this exclusive showman world. Apparently it takes a long time to be accepted by 'showman folk', and being fresh blood to it all and a 'pommie' one at that, made me feel extremely lucky to be welcomed and accepted; even if momentarily to work for the animal zoo - the most popular exhibit in the show. At least I would tell myself that. I nodded to John and then turning away, clenched my mouth like a closed fist, hiding my irritation reaction to him saying 'too easy'. I don't know, it's just something that annoyingly grinds on me, it's like someone running their nails down a blackboard. Just one of those things. spontaneously sit down in my empty chair and cry out suddenly as it tipped back, propelling his bulky body backwards with his bare feet pointing sky high on the chairs frail frame. I let out a cackle of laughter and McCaffey stumbled out of his caravan to scold John who was trying to tip himself out of the chair onto the grass. 'Quite a father and son' I thought as I shook my head, still sniggering with laughter walking back through the flap into the back of the big top. The rich smell of the tents canvas smothered my senses hard and then 'thwack' - a searing pain hit my toe as I stubbed it on the miniature bicycle used in the circus show lying behind the stage curtain. Cursing, I jumped through the curtain and onto the stage, the thudding of my footsteps echoing in the silence along with the painful throbbing of my toe. The treasure chest was gone - Errol The Snake Guy had been and taken them. I had forgotten Baz was still sleeping on the stage and he awoke to my thundering vibrations of my footstep in a gasp, turning over to examine who had disturbed him through his squinted eyes and delirious facial expression. 'Sorry Baz' I apologetically mouthed to him, grimacing as I took care to roll up my swag as quietly as I could. membered Marcus might still be sleeping too and that I could be disturbing him as well. Clutching my rolled up swag, I ducked away from the stage and approached the side curtain, tentatively pulling it back with my fingertips to reveal what was behind it. No swag. No Marcus. Just a panel of plywood on the ground where he'd set him self up for the night. Of course being owner of Rawlings Circus, I didn't think that even though he'd had his sleep disturbed in the night, he would have failed to get up early, alive and kicking for a brand new day. Draped over a solitary chair, was my showman uniform. Exactly the same as John's, the McCaffey Animal Farm blue shirt and a black baseball cap. After wiping the wet grass stems off my feet with my socks. I slipped on my favourite and most vital part of my showman uniform....my Wellington Boots or by Aussie correctness my 'Gum Boots' - the best shoes for all occasions. I wore my waterproof long footed companions constantly throughout my travels in Australia and had endured the sniggers, strange looks and mocking comments from gawping eyes who failed to see my choice of foot wear's practicality and style. Now I had a justifiable reason to wear them for the perfect use, going into the animal shed - I didn't want to be wearing anything else. I had let the calls of the animals go too far as now I could hear the whinnying of the pony and the donkey probably saying untoward things in their impatience if they could speak words. But animals are like us, they get hungry, they'll complain. 'Alright, alright, I'm coming!' I mumbled, the repetitive animal sounds continuing as I stormed out of the big top, strutting over the grass trudging my gum boots towards the core hub of noise amplifying out of the animal shed some fifty metres away. As I neared, Mabel, the white pony splotched with brown markings, paced up and down in her outdoor pen, whinnying even louder at the sight of me. She craned her neck to nuzzle my outstretched hand over the steel railing as I patted her soft nose reassuringly. Her donkey friend, more subdued, cast its droopy eyes up at me in acknowledgment or maybe it was a 'about bloody time' look intended to make me feel guilty. I marched into the animal shed, flicking back the entrance flaps of the hanging canvas and was hit by the overwhelming high pitched orchestra of animal noises, the distinguishing fusty smell of soiled straw and sawdust which was laden all over ground. Everywhere I looked, animals, animals, animals, crying out at me - the three piglets ramming their noises up against their pen squealing fanatically, the guinea pigs squeaking, the llama and cow mooing simultaneously, the puppies yapping, eagerly springing up bounding with energy as they playfully chased each other around tripping in the straw. My heart skipped a beat suddenly when I was startled by the baby goat's insistent bleating, prancing around the main pen at me. The birds were abundant in our attraction; amongst our feathered characters we boasted a goose, turkey, ducks, an intriguing variety of chicken breeds and our plump mother hen 'Henny Penny' who liked to nurture the baby chicks, making our aviary quite an impressive display. Snapping into pro activeness, I hastily started to rummage behind the drape in the corner which separated the food storage area of food bowls and water bottles to the impatient animal vocals drumming in my head. Every morning the same, every morning was the same frenetic routine. But this morning, I felt something was different. I stood still for a second and looked out onto the yard, listening hard, trying to match the animal noises to an animals face, as if I was doing a pre-school exercise. MOOO! BAAA! CHEEP! the noises continued to drum at me. I looked over to the bird pen and it dawned on me. The ducklings were nowhere to be seen. Cursing, I dropped the food bowls, letting them clatter to the ground and jogged out of the animal shed back towards the big top. John was sitting and laughing with Marcus, the circus owner, having been talked into having a beer and a *'yarn'. A look of surprise crossed both their faces as they saw me jogging towards them covered in saw dust. 'The ducklings have got out, they're not there,' I panted, my breath hitching as I hunched over, hands on my knees. 'Ah strewth, you sure? `They must have squeezed out, must be a gap in the pen somewhere,' John replied looking puzzled. 'No worries, when one duckling goes, the rest follow as a brood,' assured Marcus, tipping the neck of his beer bottle towards me. 'They can't have gone far, we'll just round them up and lead them back' presumed John, rising from his seat and placing his beer bottle down on the grass next to him. 'Ha ha, 'round them up', like they're cattle or something' I scoffed at the absurd comedy that the situation could carry. 'Can't have gone far, we'll find them' he repeated, waving his hand as a gesture for me to follow as he started to walk away. The optimistic Aussie attitude illuminating from him as we set off on our search for the ducklings. Sal Bolton is an English writer and avid female adventurer, having travelled Australia for 2 years. She has also written for 'Tennis Life UK' 'Tennis Today' Magazine and won 'Wanderlust - Travel Magazine Blog Article of the Week' May 2014. She lives in London, where she loves playing tennis, petting dogs and wonders at the world about her.